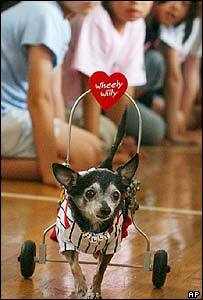 A wheelchair-bound chihuahua from the US is on a tour of Japan with his owner to tell his story of hope. Wheely Willy was crippled and abandoned before being rescued by Deborah Turner and helped to gain mobility by using a specially-designed wheelchair. Ms Turner and the 13-year-old dog are visiting schools and hospitals in Japan over the next two weeks to promote the book How Willy Got His Wheels. Willy was given a warm welcome when he arrived at Tokyo airport on Wednesday. Signs were held up saying "Welcome to Japan! ", and Willy was presented with a pilot's cap by Junko Yamauchi, senior vice-president of All Nippon Airways (ANA). "I read Ms Turner's book which was being sold in Japan and I was so impressed," he told Reuters television. "It really encouraged me and made me cheer up. We (ANA) wanted to do something for letting people know about Willy, as a social contribution." The Japanese translation of Willy's book has been on sale since February. More than 100 students turned out to see him when he made an appearance at a school near the airport. "I feel so sorry for him because he has broken legs," said eight-year-old Yoshishiro Aoki. Another eight-year-old, Atom Maki, said: "When I see dogs like him, I wish I could put them on a wheelchair." Ms Turner said she was "thrilled" to be able to share Willy's story of hope with people. "We came over to show the children that the character in the book is a real dog, and I thought they might like to meet him and be able to relate with him better," she told Reuters.